Local AM broadcasters operate on different channels in the Americas than in the rest of the world. These Medium Wave split channels are a boon for serious DX’ers. One of the neat things you can do with remote SDR listening is listening for long distance AM broadcast stations from across the ocean. This type of DX effort is supported by Medium Wave split channels. Here in the Americas, AM broadcast channels are 10 kHz wide, starting at 530 kHz. 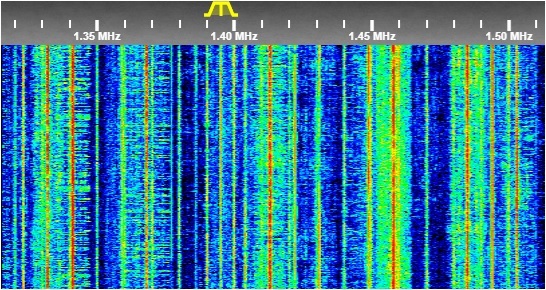 In the rest of the world, channels are 9 kHz wide beginning at 531 kHz. Simply put, that means that 90% of broadcasters outside of the Americas are on different frequencies than local stations. Often, the channels are widely separated. These offset channels mean that radio enthusiasts near coasts have a very good chance of hearing inter-continental DX on Medium Waves. All that is required is a path of darkness across the Atlantic or Pacific ocean, and a directional antenna. You need to use narrow filtering for these weak signals. Also, tuning in upper or lower sideband will help reduce co-channel interference. In the spectrum display above, you can see medium wave split channel signals from North America. They are being received on a KiwiSDR in Fernebo, Sweden, operated by SK3W. Fort example, local European signals on 1323, 1332 and 1341 kHz are stronger with red traces. The North American signals on 1320 and 1330 kHz are weaker with green traces. You can see other U.S. and Canadian AM broadcasters on 1390, 1410 and 1500 kHz. Using OpenWebRX you can find quite a few receivers that will provide opportunities for trans-ocean DX. A good place to start with your remote listening efforts is to look for Canadian and US clear channel, high power broadcasters that show up on splits. What does this kind of DX signal sound like? Typically poor, but occasionally quite good. Here are examples of listening to a local Washington, DC station in Oxford UK, and picking up a Libyan broadcaster from Michigan.